Frederick Wilson Sickler, Jr., and his wife, Vera, have lived for more than fifty years in a modest house on Peach Avenue in El Cajon, California, a city just east of San Diego. Surrounded by fruit trees and vines, and a menagerie of dogs, cats, birds, and goldfish, the Sicklers are frequently visited by their children, grandchildren, and friends. Entering their twilight years, this pleasant couple easily recalls in great detail the struggles and adventures of the pioneer Sickler clan, a story never before completely told. This account is an attempt to piece together the story of a family that has had a significant impact on the history of San Diego County. This story is of itself a part of that vast panorama of the stories of those families that emigrated to the new world before the American Revolution, participated in that historic event, and then swept westward on the tide of the Western Movement that created the nation we know today. As I sat in a rocking chair tucked in a corner of the Sickler living room ready to begin my first interview, I couldn’t believe my good fortune. For many years I had attempted to locate without success any member of the Sickler family. But, by perseverance and a great measure of luck, here we were! My interest in the Sickler family started when I was a boy living in Glendale, California. The Glendale Public Library, South Branch, was a typical small-town library on the outskirts of Los Angeles. It offered an assortment of fiction and nonfiction books, a reference section, a few contemporary magazines, and two daily newspapers. But the library was unusual in my eyes because it shelved a rather substantial collection of books and magazines dealing with mineralogy, geology, and paleontology. I had spent many hours reading book-by-book about beautifully shaped crystals, colorful minerals, water-clear gemstones, and the mines that produced them. Earliest known photo of Tourmaline Queen Mountain. 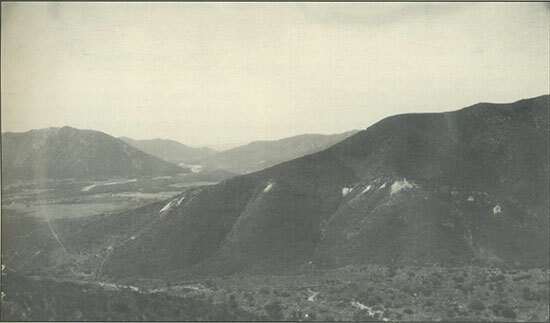 Town of Pala and San Luis Rey River at left. Ca. 1904. Photo by Waldemar Schaller. Courtesy Richard Jahns. 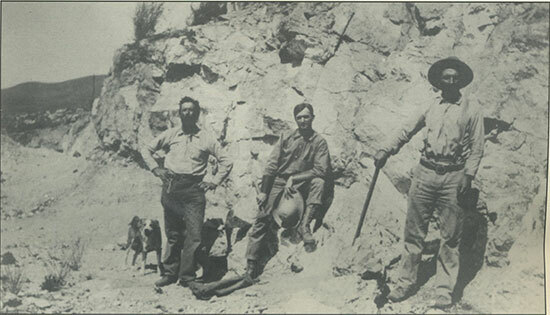 Marion Sickler, their father and an experienced gemstone miner, followed his sons to the discovery site and immediately recognized its potential. Following mining custom, he stepped off boundaries and piled rocks into small monuments at each corner, thus establishing a new mining claim. “Two horses were hitched to the family buckboard, and the three Sicklers drove sixty miles to San Diego. Young Fred Sickler named his claim the ‘White Queen Mine’ and duly filed notice in the County Courthouse. Years later, the ‘lilac-colored slivers’ were identified as kunzite, a gemstone new to science. The Sickler lads had not only discovered a new mine but also a brand-new gemstone. I had never read a more intriguing article. I began to believe that perhaps I could also make a gemstone discovery. After all, I was about the same age as the boys when they made theirs, and I too had studied mineralogy in high school. I resolved to accomplish two things soon. First, I would get my father to drive me to the Pala mines. This was rather easily accomplished. A day was spent in exploring old tunnels and in screening mine dumps. A few fairly good tourmaline crystals were added to my collection, but I failed to discover a gem mine or a new gem species. My second goal was to locate one of the Sickler “boys,” if still alive, in order to learn first-hand about San Diego County gem mines. This was not to be, for while I met miners and others who had known the Sicklers, none knew of their whereabouts. Over the years, I visited Pala mines a number of times and, in the process, met an old miner named George Ashley. Never married, Ashley had bought the old Sickler house and seven mines on Heriart Mountain, and continued to live alone. He, too, had lost track of the Sicklers. Ashley was a skilled miner and a master gem cutter and carver. He had invented machinery that enabled him to precision-cut three and four inch gemstone bowls of great beauty. Collections of his bowls are housed in the Smithsonian Institution and the San Diego Museum of Natural History. On October 24, 1991, San Diego County Supervisors issued a proclamation honoring “George Ashley, last of the old-time miners.” Seven months later, Ashley walked alone out into the hills and died. He was eighty-seven years old. At Ashley’s wake, I was introduced to Mrs. Elizabeth Schell, who had come to honor Ashley. I was amazed to learn that she was the sister of Fred Sickler, Jr., who was alive and living sixty miles south in El Cajon. Within a week, I had the first of many interviews with Fred and Vera Sickler. Fortunately, they had retained an interesting collection of old family photographs, articles, and documents, most of which are unpublished. Also on hand were a few magazine stories about the two Sicklers. Much of the information, however, appeared to be largely hearsay, and a few statements were obviously inaccurate or fictitious. With corrections in hand and a goodly supply of new material, this article reveals for the first time the incredible vitality, perseverance, and pioneering spirit of the Sickler family a family that traces its ancestry to Revolutionary War times, that played a significant part in the history of San Diego County, and that currently has a number of surviving members living in that area. The “Type Locality” for Kunzite as a new mineral “species” was the Pala Chief Mine, shown here, 1904. Left to right are: “Bernardo,” Fred M. Sickler, Sr., and “Pedro.” A large cluster of quartz crystals is next to Pedro’s right foot. Photo by H. C. Gordon, San Diego. Courtesy William Larson. Our story begins with two German immigrants who came to America at some time in the 1760s. George and Besiah Sickler packed a few personal belongings and, leaving friends and loved ones in the long-time family home in Hess, Germany, took ship for the New World. No record exists of the Atlantic crossing, but their ship docked at New York harbor. Upon repeated inquiry, George learned that timbered land suitable for farming was available somewhere east of Poughkeepsie some sixty-five land miles up the Hudson River from New York City. Outfitting with pioneer farming equipment for this land journey proved to be arduous and time-consuming, but once the wagons were loaded and headed north, the Sicklers were once again in good spirits. Extremely rough roads caused delays, but the party eventually arrived at the newly established James Vanderburg farm. Just west of the farm was an unoccupied, heavily timbered, hilly area that with considerable work could be made into farmland. The Sicklers had found their new home. Many months were spent clearing land for farming, digging a well, and building stock pens and a modest house all before winter set in. In time, Besiah produced seven boys and four girls, and the farm prospered. However, pioneer living in the 1770s was becoming more uncertain and hazardous. Renegade bands of Iroquois Indians raided the countryside, and units of British troops were everywhere, arresting those who disdained the king and collecting taxes that the settlers thought unfair. As elsewhere in the colonies, disgruntled farmers and city folk began to talk revolution. Both the British and Americans had built iron smelters and factories for the construction of cannons. Not far from the Sickler farm was tiny Lake Sylvan, the bottom of which was covered with a thick layer of an iron-manganese concentrate ideal for casting into heavy artillery. The Americans built a foundry next to the lake and were able to forge the best cannons in the New World. As a result, the British, contrary to standard mercantile theory of that time, were forced to buy American manufactured artillery. George Sickler, because of his Hessian background and experience with metals in Germany, served as a consultant to the American works. When the colonists declared their independence, British armies found themselves without top-quality cannon sources, while the Militiamen had an abundant supply—an imbalance that some would argue would be a major factor in the colonial victory. Revolutionary War years were times of even greater insecurity and upheaval, particularly for pioneers living on the frontier. Many farms and small shops were left unattended as menfolk departed to join the Militia. James Vanderburg, the neighbor of the Sicklers and a close friend of General George Washington, was appointed Colonel of the 5th New York Regulars. According to Sickler family tradition, Washington was said to have been a frequent visitor at the Vanderburg place, and the Sicklers knew Washington well and staunchly believed in the revolution. All able-bodied Sickler men left home to fight with the Continental 5th New York Regulars. George Sickler is listed on the Roll of Militiamen and his will was signed by Gilbert Livingstone, surrogate of Dutchess County, New York. Sickler died in 1791 and was probably buried on the old homestead. During the decades of the late 18th and early 19th centuries, some Sicklers remained farmers and backcountry pioneers, but many gravitated to towns, becoming shopkeepers and businessmen. For the most part, typical of the times, the women kept house and raised children. Energetic genealogical research and a review of remaining family documents have revealed but sketchy information on the whereabouts and activities of Sicklers during these times. Many are remembered by name only. But a few interesting Sickler vignettes from this era have survived. One important event occurred when George Sickler III married a young woman named Dorcus Vanderburg, who had grown up on the neighboring farm. She had previously married General Richard Montgomery of the Revolutionary Army and was widowed when he was killed in the battle of Quebec in 1775. George Sickler III died in 1801, and a copy of his will bequeathed his entire estate to Dorcus. This Sickler-Vanderburg branch of the Sickler family is the one that was to bring the Sickler name into the history of San Diego County. A generation later, George Sickler IV married Lucy White, a direct descendant of Perigan White, the first baby born on the Mayflower. While the children of George and Lucy were still young, word reached the Sicklers that a smallpox epidemic had ravaged much of eastern New York State and was moving rapidly in their direction. Without hesitation, they decided to abandon their farm and, in the middle of the night, loaded the children and a few possessions into a covered wagon and headed west into Pennsylvania. Eventually, the family established a new home near Buttermilk Falls (later shortened to Falls), Pennsylvania. Both George and Lucy are buried in Falls. It is interesting to note that Sickler boys were rather frequently given middle names honoring famous Romans and Europeans. Examples are Arthelo, Marcellus, Orlando, Napoleon, and Wilhelm. Possibly this custom resulted from the American habit of naming New World towns after such historically important Greek and Roman cities as Albany, Syracuse, and Troy. As American society became more diverse in occupational opportunities, many Sicklers became restless and dissatisfied with farming chores or confining jobs and embarked on new vocations or professions. Over the years, Sicklers became doctors, teachers, millers, chemists, photographers, bankers, printers, lawyers, university professors, miners, aircraft pilots, city marshals, and aeronautical engineers. Many Sicklers were distinguished; a few were just plain vagabonds. One of those distinguished Sicklers was Dr. Frederick Vanderburg Sickler, who married Elizabeth Ross Covey in 1848. Elizabeth’s mother was a direct descendant of Betsy Ross of Philadelphia, who had taken over her late husband’s upholstery business in Philadelphia. Working from George Washington’s rough sketch, Betsy secretly made the first American flag in June of 1776, just before the Declaration of Independence was declared on July 4. Frederick and Elizabeth had four sons, each of whom led an unusual life. The two youngest sons of this Sickler-Vanderburg lineage were to spend most of their lives in San Diego County, and they and their progeny are largely the subject of this story. Harley Napoleon Sickler was the first son. As a young man, he was hired as a carpenter in a box factory, worked his way up to manager, and eventually owner. The firm’s main product was wooden ammunition boxes for the U.S. Army. Harley heard that a nearby firm was making corrugated paper boxes, the first enterprise of this type in America. Curious as to how the boxes were constructed, Harley requested permission to visit the plant. His request was denied. Waiting until the weekend, he got the watchman drunk, who then escorted him on a tour of the factory. Seeing what he wanted to know, Harley bought the paper plant and eventually became the first Sickler millionaire. Blanche, one of Harley’s daughters, married an architect-engineer named Moore, who designed the Indianapolis Motor Speedway. Active in women’s affairs, Blanche headed the Women’s Federation for the State of New York. Hernando Orlando Sickler was the second son of Fred and Elizabeth. His specialty was photography. He opened a photo shop that became one of the most successful and best-known such businesses in Buffalo, New York. William Arthelo Sickler, known to his family and friends as “W. A.,” was the third son. He was destined to playa prominent role in the history of San Diego County. W. A. was born at Mill City, Pennsylvania, on December 5, 1855. 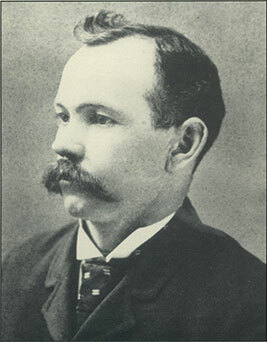 Upon completing his education in New York City in 1880, he came to San Diego County, where he homesteaded a farm in Spencer Valley, near Julian. Marion Marcellus Sickler, generally known throughout his life as “M. M.,” was the fourth son. He was born in Philadelphia in 1853. While still a young man, M. M. joined the U. S. Army and, because of his skill with horses, was assigned to a cavalry unit. Recognizing his leadership potential, the Army sent him to Washington, D. C., as part of the organization of the first Army Signal Corps. His commander, Gen. Greely, twice led expeditions to Greenland, and M. M. was part of his command. 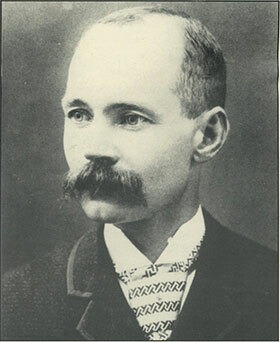 W. A. Sickler in his 30s. Courtesy Fred & Vera Sickler. Once established at his homestead in Spencer Valley, “W. A.,” invited his father, Dr. Frederick Vanderburg Sickler, to visit. Prior to that visit, Dr. Sickler had sent a bundle of maple saplings to W. A. When the father arrived, he noted that the young maples were in leaf and commented: “Your air smells exactly the same as [at] my home in Lake Wynola.” From that moment on, W. A.’s homestead was known as Wynola Ranch. New families began to settle near Wynola Ranch and, to accommodate their children, W. A. built a one-room schoolhouse, deeded the school and five acres of land to the school district, and became its first school teacher. 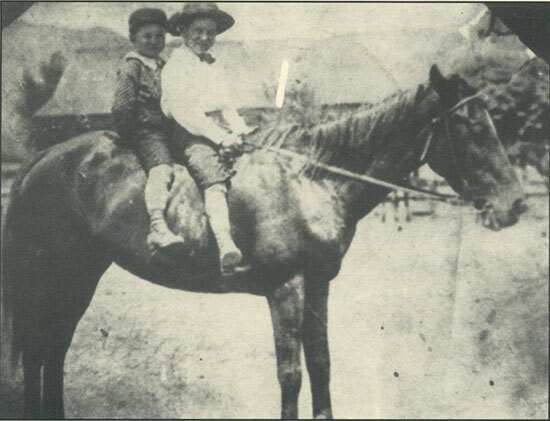 W. A. taught elementary grades and had no difficulty with the children until the Sawday family arrived in the valley with a herd of Texas cattle. The oldest Sawday son, a huge kid, began to give W. A. a bad time in the classroom. Even after repeated warnings, the young bully continued to cause problems. Finally, W. A. lost his temper and heaved the kid through a window. There was no more trouble. Happy with teaching, W. A. also taught in the public schools of Encinitas and Monserrate. W. A. married Elizabeth Honeywell, a San Diego County schoolteacher. His later business career spanned many enterprises. In partnership with a Mr. Jasper, W. A. published the Julian Sentinel newspaper. Later, he assisted engineer James Savage in constructing the Escondido canal and dam. W. A. was careful with his money, and developed an unusual ability for making wise investments. He bankrolled a number of San Diego County residents and personally refinanced the Escondido Bank, enabling it to avoid failure. He also farmed grain in Rancho Bernardo and Encinitas and surveyed properties in Julian and Banner Grade. His career in public service and in the public sector also was impressive. He was appointed superintendent of the San Dieguito Water District. He was a member of the San Diego County Board of Education and a councilman in the city of Escondido. Later, W. A. became a U. S. Deputy Surveyor, plotting major units of government land in Imperial Valley, as well as in many of California’s forest reserves and parks, including Yosemite. When a man named Savage, W. A.’s former boss, became director of U.S. reclamation projects in the Northwest, he hired W. A. as his chief consulting engineer, with offices in Powell, Wyoming. One of W. A.’s biggest projects was to supervise construction of the Shoshone Dam near Yellowstone Park. During World War I, W. A. returned to New York to engage in the manufacture of munitions at Buffalo. At the close of the war, he developed a number of furniture and box manufacturing plants. He remained active in these ventures until he died at his home in Buffalo at the age of 87. W. A. left a niece, Mrs. Blanche Moore of Florida; two nephews, Fred Sickler of Oceanside and Allan Sickler of Pasadena; six grandnieces and nephews, and five great-grandnieces and nephews. Many of the maple trees planted years ago on W. A.’s Wynola Ranch in Spencer Valley survive today. M. M. Sickler in his 20s. Courtesy Fred & Vera Sickler. Two years younger than W. A., Marion Sickler (M. M.) was to be a key player in the development of the pegmatite gem mines of San Diego’s backcountry. Upon returning to the United States from his assignments in Greenland, M. M. set up weather bureaus in San Francisco, San Diego, and Yuma, Arizona. He was next assigned to a signal station in St. Louis, Missouri. One day, his telegraph [no wireless for years] spelled out a message that Gen. George A. Custer and his command had been wiped out by a superior force of Indians at Montana’s Little Big Horn. It was M. M.’s sad duty to report to his commanding officer the details of the massacre and the fact that the C.O.’s son had been lost with Custer.